“The fact that the Eurovision is taking place this year in a country guilty of ongoing serious human rights abuses, including against journalists, means there will be members of ours who feel that for ethical reasons they can’t participate in coverage of the contest. We debated our attitude towards this [last] week and the branch decided by a very strong majority to express our willingness to support any member in that position. 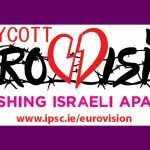 The Irish Campaign to Boycott the Eurovision in 2019 reiterates our call for RTÉ and any performers not to participate in the song contest in Israel. Further, we ask RTÉ to support the call from the Palestine Liberation Organisation (PLO) and the Palestinian Journalists’ Syndicate not to broadcast the Eurovision Song Contest in Israel’s illegal settlements, including those in occupied East Jerusalem; the least RTÉ should do to be in line with international law and European policy. We also welcome the Dublin Broadcasting Branch of the NUJ’s condemnation of Israel’s attacks on Palestinian journalists and hope that their colleagues in Ireland will show solidarity with them by refusing to take part in Eurovision in Israel. We further note that more than two hundred Palestinians have been killed by Israel since the Eurovision win last May and it is totally unconscionable to participate in an event that is designed to ‘artwash’ the repression, so often fatal, of the Palestinian people that Israel has engaged in since 1948. The Dublin Broadcasting Branch condemns Israel’s continued attacks on journalists and on freedom of expression and notes that since last April its forces have shot and killed two journalists reporting from Gaza’s border and injured with live rounds at least 20 more. The branch welcomes the statement by RTE’s Director General Dee Forbes that RTE will not sanction any staff member who declines to travel to Israel to cover the forthcoming Eurovision Song Contest on conscientious grounds. The branch will support any member, working in RTE or elsewhere, who chooses to exercise a conscientious objection towards involvement in coverage of the song contest.